This is a reconstruction, commissioned by Ian Pittaway, of an instrument recently discovered during an archaeological dig in Elblag, in Poland. It is one of several instruments found in a latrine, where conditions preserved the wood remarkably well. It is usually called the "Elblag Gittern", but after much research and experimentation, and lengthy correspondence with the staff of Elbag Museum, we are now convinced that it is a medieval version of the Koboz (or cobza), an instrument which is still commonly played in eastern Europe. There is no sign of frets on the original, and the shape of the neck would make tying on frets very difficult. String spacing at the bridge is very wide, which implies a specific playing technique. The modern koboz is much bigger, but all these features are plainly visible. The original instrument is quite crudely carved. I have tried to keep the rustic feel, while smartening it up a little. YouTube has many fine examples of the modern koboz being played. It is usually played with a plectrum. 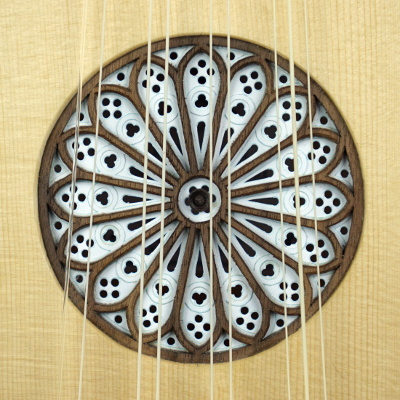 Different players prefer modern guitar picks, goose quills, or a "risha", similar to that used on the Arabic Ud. Ian is currently researching music from medieval Poland. A sound clip will appear below when he's recorded the result. The tuning can, of course, be modified to your own specification. With slight modifications to the shape of the neck, and the addition of frets, it can be set up as a gittern, if you don't fancy East European medieval music. Cases - Excellent cases can be ordered from specialist manufacturers such as Kingham MTM, but they're pricy. I can supply an attractive, custom-built plywood case, black with chrome fittings, for £180 when ordered with an instrument. Delivery - the price depends on where you live. Please enquire. I hate it when websites say "Phone for a quote", so to give you some idea - getting a baroque guitar in its case to America, including insurance, is currently about £130. Getting one to Kent is about half that. Waiting time, from placing an order to clutching your new baby, is currently about 10 months. It's very approximate, because the schedule often contains items that are somewhat experimental, and they may take more or less time to complete than anticipated. Usually more. Deposit - I usually ask for £150 (non-returnable unless I'm dead, insane, incapacitated or incarcerated) to secure an order and cover materials. Once that's paid, your order is entered into my Magic Book. Nothing happens for several months, then you receive an email to tell you I've started construction. A few weeks later, a big parcel arrives, and you squeal with delight. 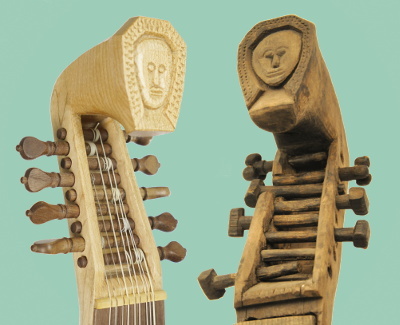 A note on HUMIDITY - delicate wooden instruments are remarkably resilient, but they can have major problems with both high and low atmospheric humidity levels. I keep my workshop at the recommended humidity level, between 45% and 50%. Low humidity can shrink wood, resulting in cracks. High humidity can loosen glue joints, especially when it's coupled with high temperature. There's plenty of advice on the Web, but I'm compiling a brief summary of recommendations which I'll upload soon.